Ahead of the President Muhammadu Buhari’s campaign visit to Ogun state, palpable tension has engulfed Abeokuta, the state capital as security agents have begun to intercept dangerous weapons and as well arresting their carriers. Tension began to build up, when it became a reality that three political staunch enemies will visit the venue and they include ; supporters of the Allied People Movement, the two factions of the All Progressives Congress in the state led by the governor, Senator Ibikunle Amosun and the former governor, Aremo Olusegun Osoba respectively. The President is said to arrive the state at 3:00pm, but the APM and APC members have started arriving the venue as early as 5:00am. When visited the venue of the rally at MKO stadium at kuto area of the state capital, it was observed that there were heavy security in and outside the venue as security from Abuja were seen to have taken over the event. Reporter who visited the venue also saw both the supporters of the APC and APM trooping into the stadium but were thoroughly searched at the entrance of the venue by armed security men. 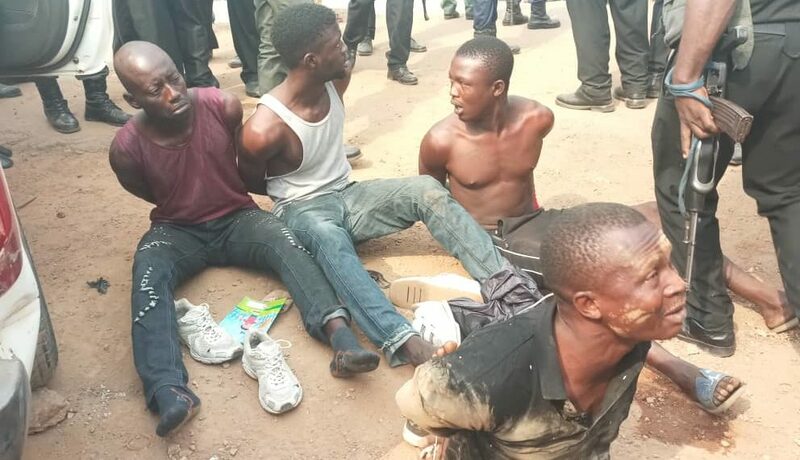 It was also gathered that the security agents have arrested some thugs with different charms, cutlass and axes. The suspected thugs have been taken to the nearest police station as at the time of filing this report. Efforts made to contact the Police spokesperson, DSP Abimbola Oyeyemi was proved abortive as calls put across to him were not picked.